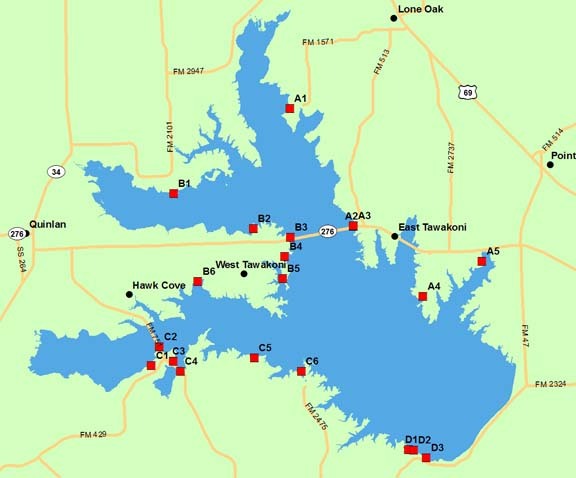 Camping, picnic areas and a four-lane boat ramp are available in Lake Tawakoni State Park. There are five other public boat ramps and numerous privately-owned access facilities near the lake. Accommodations range from motels and cabins to RV sites and tent camping. Various facilities offer bait and tackle shops, convenience stores, fishing piers, gas pumps, and restaurants. For details, choose a point on the map or a name in the chart below.